There is so much to learn from the story of Joseph in the Old Testament. 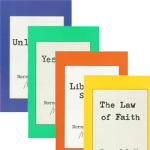 Most readers are well acquainted with Joseph but may not have given thought to the incredible example he provides us of a person discovering their union with the Holy Spirit, as well as a model of the Spirit of obedience living within. This issue of The Intercessor will explore the numerous lessons to be learned from the life of Joseph. From discovering “no independent self,” faith and obedience, and Godly forgiveness, to recognizing God’s determined plan in ALL things—you are sure to take away much wisdom from the following pages. Our lead article, an excerpt from Norman Grubb’s book, Who Am I?, is titled “God Determines, Not Permits.” Norman lays out a multitude of scripture references that point to the conclusion that God does not merely permit ANYTHING—including suffering. But, rather, He determines ALL of it. Our job, as believers, is to transfer our believing from seeing the outer manifestation of the problem, to seeing that God lies behind it— “seeing through” to God in all things. A revolutionary conclusion that Joseph came to in reference to what his brothers did to him—”You meant evil unto me, but God meant it for good (Gen. 50:20). Follow up with a fascinating study by Jon Langley in “God’s Providential Plan—Through Joseph.” Jon really hits the nail on the head, stating that the true meaning behind the story of Joseph is to show the Spirit of God operating through him. Taking us through the story piece by piece, Jon puts us in Joseph’s shoes, as we are clearly shown the true character of Joseph and God operating through him at every step in his journey. It is a shining example of Spirit union and what God can do through a Spirit-led vessel. This issue’s “Bible Bedrock” takes Joseph’s famous quote from Genesis 50 and delves deep: “Ye thought evil against me, but God meant it unto good (Gen. 50:20).” Norman piles on scripture from the Old Testament to show us biblical proof that ALL things (not just what appears to be “good”) come from God—the supreme All-in-All. Everything comes from God, and everything from God is good, but may not always seem so to our human eyes. It takes faith to see-through and see God in all things. Here, Norman gives us the Biblical foundation for this faith. We are also thrilled to share with you a moving testimony, “Forgiven,” from Vicki Larkowski. With her refreshing honesty, Vicki is able to paint a compelling picture of her rebellion against God’s way, the lies that Satan used to lure her (and keep her) away, and the deliberate choices she made to finally say “no” to Satan and “yes” to God. Confession and repentance from her sin ultimately led her to beautiful Biblical forgiveness. The restoration and forgiveness she received from those she had cut out of her life is likened to what the eleven brothers received from Joseph. When Joseph saw his brothers’ changed lives and sorrow over their previous actions, an emotional and forgiving Joseph eagerly took them back. Finally, we’ve included a couple of our popular regular features—a “CrossWord” puzzle and “Faith Illustrations.” You can test your scripture knowledge in our “Living By Faith” puzzle on what God’s word reveals about the wonders of faith. Also, “Faith Illustrations” is fabulous, as usual. Our talented artist on staff gifts us with hand drawings that bring the Joseph story to life. This edition takes us from Genesis 37-40, so look forward to a part-two in the upcoming issue. 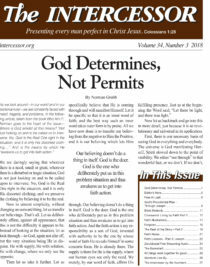 We believe you’ll take away much wisdom from the pages in this issue of The Intercessor. Thank you for reading and supporting!